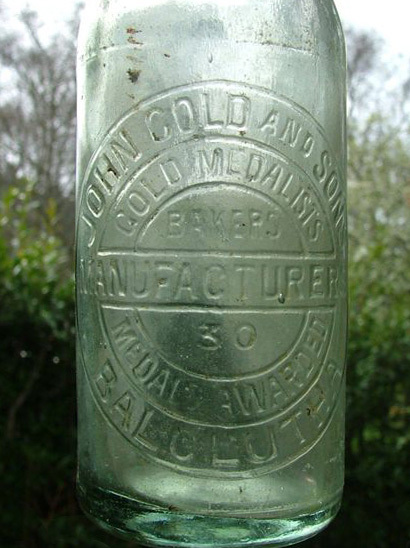 A John Gold & Sons of Balclutha crown cap soft drink bottle, probably 1920s. Image courtesy of Graeme, aka grayman on Trade Me, The Oddity, Waikouaiti. This one really had me stumped this morning. Thinking at first it was a soft drink, being a typical early crown-cap bottle – I had no records coming up anywhere for a “John Cold”, which by now I know means something is not right. Then I noticed it stated “baker” in the embossing. What kind of product could it be? Tomato sauce was the first thing that crossed my mind. All that fruit and sugar used to make preserves goes hand in hand with with baking and confectionery . Dozens of searches in my usual go-tos were fruitless (sorry! ), and that’s just not possible. Eventually I struck Gold. Literally. The name is spelled wrong on the bottle! The Waitomo departing New Zealand for the U.K. in April 1915 with two bakers aboard: John Gold and Edgar (sic) Gold. John Gold was operating in Clutha in the first quarter of the C20th. He was born in Scotland, 1873 where he won the majority of his thirty plus medals for his fine baking skills. He had arrived with his family in 1908 which included wife Margaret Boyes Gold, and offspring James and Edward Boyes Gold (1896-1968) who formed with him John Gold & Sons in the mid-teens. He possibly also had daughters Annie and Mary, Records of the family coming into Wellington on the “Tongariro” show two females whose names both begin with M. A later record shows John leaving on the “Waitomo” in 1915, no doubt on one of his many trips back to the U.K. for shows and conventions, with an Edgar, also a baker (obviously a mistake with the name). First residing in Dunedin, he came to Balclutha in early 1915 and purchased the business of A. Hutton in Clyde Street, in early February 1916. He immediately developed a beneficial strategic relationship with a client – The Dominion Pressed Yeast Co (later D.Y.C Vinegar, which many will remember) – enough so that they wrote a glowing testimonial for his bread in 1916 which was used publicly as an advert. L: A John Gold & Sons of Balclutha crown cap soft drink bottle, probably 1920s. Image courtesy of Graeme, aka grayman on Trade Me, The Oddity, Waikouaiti. 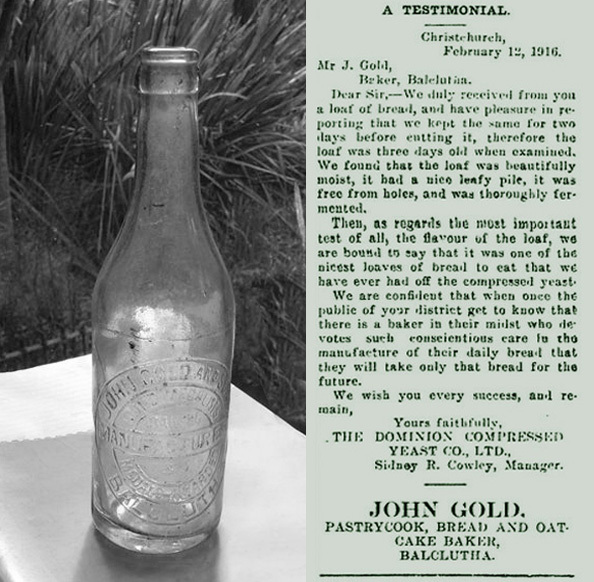 R: Advertisement for J (John) Gold’s baked goods with testimonial from D.Y.C, Clutha Leader, 21 April 1916. Image Courtesy of the National Library of New Zealand. Hi Do you have any of there syphons ? Hi Dave, no I don’t have any more information on the siphons. I do keep an eye out for interesting and rare examples more out of curiosity of what they are selling for. thanks do you have a collection of syphons ? No, I don’t collect syphons. My mother has a couple like Grey & Menzies but nothing particularly rare. Thanks, it’s interesting they seem to have not registered the birth of any of their children in New Zealand. Not that unusual though – seemingly back then it was quite arbitrary. Hi great work mate, the syphon I have dates between 1921 and 1934 based on the supplier name and base mark, would love to find out more ,do you have any other info about any NZ syphons ? As above, no I don’t. Today on Trade Me a rare John Gold crown top for sale. Thanks ,yes I saw that one list, I have found that John Gold and his sons James and Edward purchased Walter Henderson & Co around 1924 and sold to Lane’s Ltd around 1940 ,I would love to nail the dates down but haven’t yet!. Thanks Dave. I’ve never heard of Henderson and didn’t know either of those things. Oh, I had no idea you were writing a book. I generally only pay attention to the really unusual ones, like pink or blue glass just out of curiosity to see what they end up selling for. Other than that I just add brands and businesses to my soft drink database usually noted just as a product soda water, not whether it was a syphon or bottle. I’d say that soft drinks may well be the longest list out of sixty categories I keep. There was an unusual one this week listed on Trade Me from the Waipukurau Aerated Water Co. I’ve looked at soft drink history fairly intently in that area and that was a new one for me. Yes I would love to find some info on Waipukurau aerated Water co, I still have a hand full of firms I know nothing about! And this is one of them. I have only recorded them having one syphon, but in two year 1938-39, I have only recorded 7 of them so far there will be most likely. No, I haven’t been able to find out anything about them, either. Hi this is my fathers great grandfather. He went on a ship in 1915 with soldiers that were fighting in WW1 he was the cook, he did this so that he could visit his two sons James and Eddy who were fighting in WW1. Just wondering if you have this bottle? We are looking for this bottle or any other memorabilia. Hi Rachel, thanks for the information. No, I don’t own that item. Seemingly they are fairly hard to come by and reasonably desirable with collectors now. My advice is to enter a search in Trade Me in which nothing will come up, but save the search and they will email you when something becomes available. just a point of interest but if you are related to the Bells from Balclutha then you will have a connection to J Gold and Son via a great uncle. Let me know if you want further info on this connection.